Feel free to contact us if you have any questions or simply write us an email. In the case of an emergency, if we are closed or you cannot reach us, please call the NHS on 111. 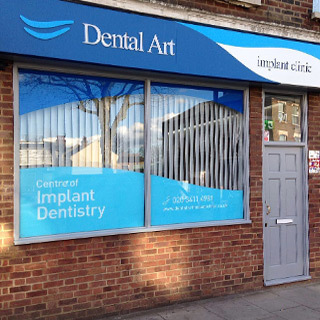 We are happy to invite everyone to our modern dental implant clinic located at 91 High Road, East Finchley, N2 8AG! 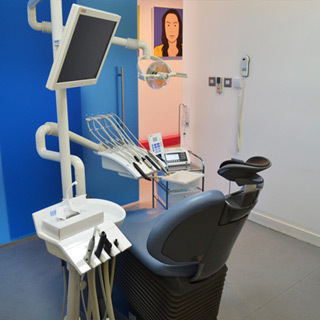 You will be welcomed by our friendly staff into our fully refurbished, 3-sugery implant clinic completed with a CT scan machine and other state of the art technologies that are used by dental experts around the world. If you have an enquiry about appointments or treatment at our East Finchley clinic, please get in touch with us using the contact details below. Our clinic is located on High Road in East Finchley. It is approximately 5 minutes' walk from East Finchley Station (Northern Line) underground station. The nearest bus stop to our clinic is: Fairlawn Avenue (Stops J, K, S) Buses that arrive here are: 102, 143, 234, 263, 603. Unfortunately, we do not have a car park for our clinic. On certain places on High Road, it is possible to park on the street using pay and display between 8am and 6:30pm Monday to Saturday. The maximum stay is 1.5 hours at a cost of £1.95. Our busy Swiss Cottage practice, located on Finchley Road, has been established for a number of years. During this time, we have had the pleasure of welcoming thousands of people interested in finding out more about dental implant treatment — and have restored the smiles of our many happy patients! If you have an enquiry about appointments or treatment at our Swiss Cottage clinic, please get in touch with us using the contact details below. College Crescent Bus Stop (Stop A). Bus numbers: 13, 82, 113, 187, 268, C11. Free parking facilities are available at the nearby "O2 Shopping Centre". However, you will need to buy products of a minimum value of £5 to claim the 2 hours free parking. Our modern and spacious Balham clinic is located at 143-145 Balham Hill. If you have an enquiry about appointments or treatment at our Balham clinic, please get in touch with us using the contact details below. The closest tube stations to our clinic are both approximately 10-minute walks away - Clapham South Station and Balham Station. Balham Train Station located on the Northern Train Line, can be accessed easily via train as well. There is a bus stop about a minute away from the clinic - Alderbrook Road and Balham New Road stop is about 5 minutes away. Buses that stop here are 155, 249 and 355. Dental Art Implant Clinic Ltd.